“It’s with the Stewards.” “They have been called to the Stewards.” “It’s the decision of the Stewards.” These phrases can often be heard at international motorsport meetings, but what exactly do they mean and what happens behind closed doors? These phrases can often be heard at international motorsport meetings, but what exactly do they mean and what actually happens behind the closed doors of the Panel of Stewards at all rounds of the FIA World Endurance Championship, including the 24 Hours of Le Mans? 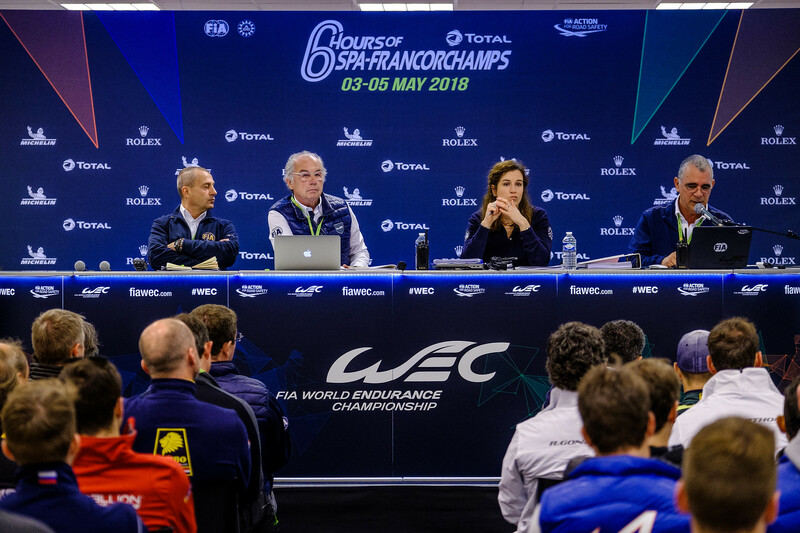 In order to find out more about the work of these FIA Officials and the extent to which they go to ensure parity, a fair hearing and justice for all, we spoke to the permanent Chairman of the Panel of Stewards for the WEC, Jean-Francois Veroux. As a practising lawyer with over 45 years’ experience, and a competitor for almost 30 years, Maître Veroux brings his judicial skill and motorsport understanding together to lead a panel of three Stewards (6 at Le Mans), of which one is always a national representative of the country in which the race is being held. Q: What is the precise role of the Panel of Stewards? J-FV: “The role of the Stewards is principally to uphold the Regulations and to ensure that these are fully respected. We are also charged with applying all penalties for any infringement of the rules, sporting or technical. “In motorsport it’s very specific. As far as anything that happens on the track is concerned, it’s the responsibility of the Race Director to deal with this. He’s in total charge, especially regarding the safety aspects of the race. However, if he sees something which could be an infringement or is non-compliant with the rules, he can transfer the case to the Stewards. “The Race Director can continue to watch what is happening in the race and on the track, and it becomes the duty of the Stewards – who function as a kind of Tribunal or Arbitration Court – to investigate each individual case presented to them. Q: How is the Panel of Stewards selected? J-FV: “All FIA Stewards must be licensed by both their ASN (national governing body of motorsport) and the FIA, and I was appointed as Permanent Chairman of the Panel of Stewards for the WEC in 2012. “Since 2012 we have had a small group of four permanent International Stewards who work on rotation with me, and at every race the Panel is composed of the Chairman, one of either Tim Mayer, Michael Schwaegerl or Yves Bacquelaine, and one national Steward put forward by the ASN of the country in which we are racing. We also have a permanent Secretary to the Stewards, Irmi Quendler, who helps us on the administrative side, plus the FIA Driver Advisor, Yannick Dalmas, who can be called on to give a specific point of view if we need it. “International FIA Stewards have to be trained and pass an exam in order to be licensed and then attend several seminars organised by the FIA, and all of them have considerable motorsport experience behind them. As an example, at the 6 Hours of Fuji we had an Australian colleague with us who was in training for his international licence and he was with us every moment of the race weekend. It’s not mandatory for a Steward to have been a competitor themselves, but it could be considered as an advantage. Q: What other tasks do the Panel of Stewards carry out during a race weekend? J-FV: “There is quite a lot of procedural paperwork which has to be officially checked at the start of each race weekend, such as ensuring that all the relevant licences are valid, including the circuit’s licence, that the Judges of Fact are authorised, that the correct insurances are in place, the licences and medical certificates of the drivers are all correct and so on.